Barcelona were left nine points ahead of second-placed Atletico Madrid, which beat Celta Vigo 2-0. Barcelona's Malcolm Oliveira, right, heads the ball during the Spanish La Liga soccer match against Huesca. With Lionel Messi and most of his regular fellow starters resting up for Manchester United, Barcelona coach Ernesto Valverde tried to get a glimpse of the club's future. 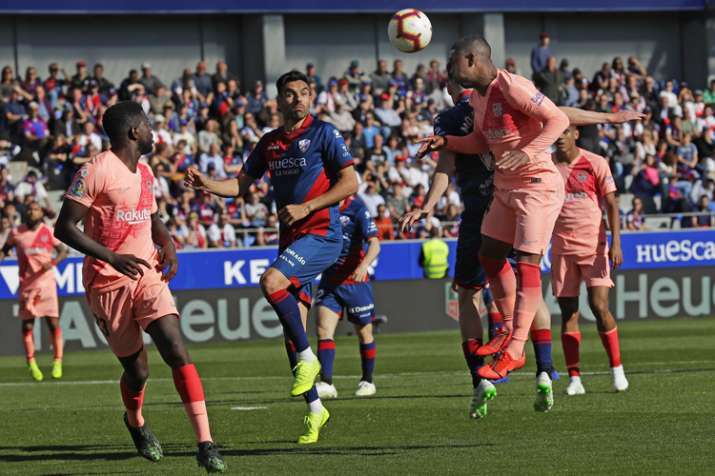 Valverde fielded an almost unrecognizable starting 11 on Saturday in a 0-0 draw at Huesca, the Spanish league's bottom team. Senegal right back Moussa Wague, 20, and French center-back Jean-Clair Todibo, 19, made their debuts, while midfielder Riqui Puig, 19, made his first league appearance.